I found a fabulous recipe in the Oct issue of Cooking Light – a healthy version of a cinnamon roll. I had never made real cinnamon rolls before. 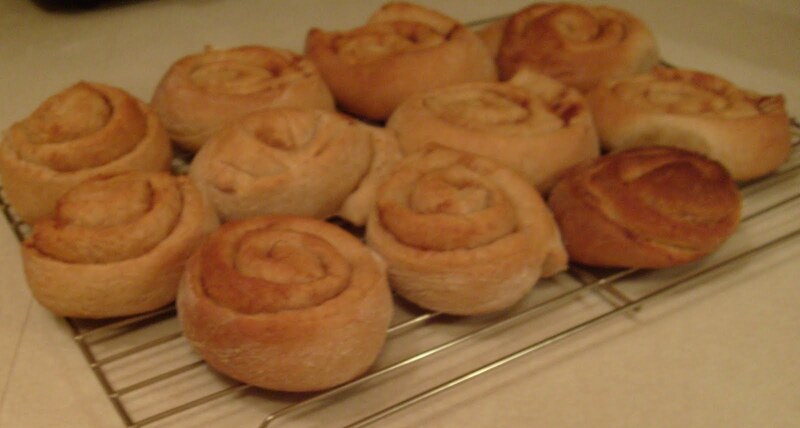 Sure, I’ve made the Pillsbury rolls that come out of that cardboard carton that pops when you open it, but I had never made the real thing. 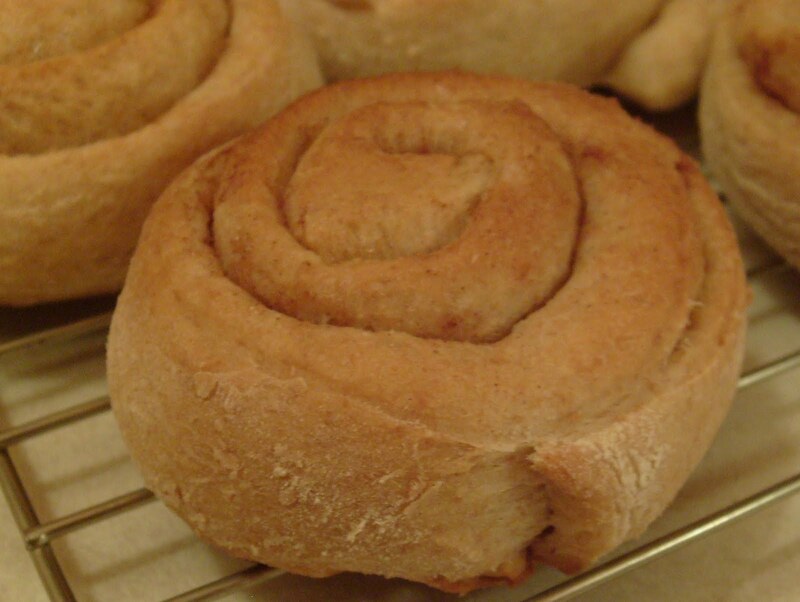 I tweaked the recipe just a bit by adding whole wheat flour to make the roll even healthier. They are especially delicious warmed up with hot glaze on top. Be sure you have about 3 hours set aside to make these. I started them at 6:30pm thinking I had tons of time, but at 9pm I was just putting them into the oven! The final product is well worth the work, just be sure you know what you are getting into before you get started. Combine milk, 3 tbsp melted butter, 1 tbsp granulated sugar, and yeast. Let stand 5 minutes. Add egg and remaining sugar to the bowl. Mix well. Mix the two types of flour together in a separate, small bowl. Stir 1 cup of the flour mixture into the yeast-milk bowl. Let stand 10 minutes. Add 2 1/2 cups of flour and salt to the yeast-milk mixture. Stir until a soft dough forms. Turn dough out onto a floured surface. Add some of the flour mixture to the dough (only a tbsp or two to coat the dough) and begin kneading. Knead until the dough is smooth and elastic, about 6 minutes. Continue to add flour as needed. Place dough in a large bowl coated with cooking spray. Turn the dough to coat and cover with a towel. Let stand in a warm place that is draft free for 35 minutes (an oven, off of course, works well). Gently press the dough with 2 fingers. If the indentation remains, the dough has doubled in size. Punch down the dough, cover, and let rise again for 35 minutes. Turn dough out onto a floured surface and roll into an 11″ x 8″ rectangle.Spread the softened butter over the dough and sprinkle with brown sugar and cinnamon mixture. Be sure to use a lot! Beginning at the long side, roll the dough tightly like a jelly roll. Pinch the seam to seal. 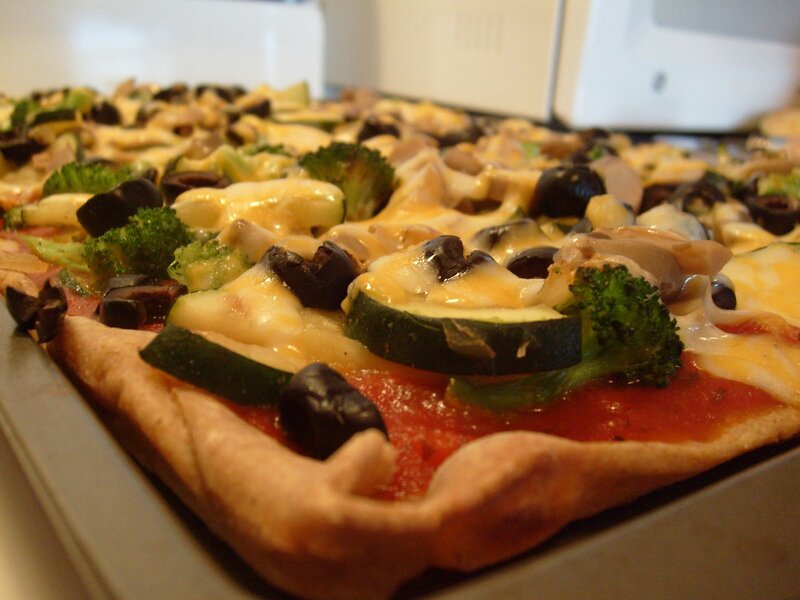 Cut dough into 18 – 20 1″ slices. Arrange 9-10 rolls on a greased cookie sheet or baking dish. Cover and let rise 35 minutes, or until doubled in size. Uncover rolls and bake for 22 minutes or until lightly browned (I did mine for 22 minutes and 1 pan was quite brown, so I think 15-20 minutes is a good point to check them). Let cool on a wire rack. Store in a sealed container. Mix 5 tbsp powdered sugar and 1 tsp vanilla together. Stirring with a fork, slowly add milk 1 tbsp at a time, until a thin liquid forms. Refrigerate until use. Microwave before using. Combine butter and cream. Stir with a whisk. Add vanilla and gradually add powdered sugar. Stir until blended. Serve warm. While Jason and I have been making our own bread for over a year, we have yet to make our own buns. 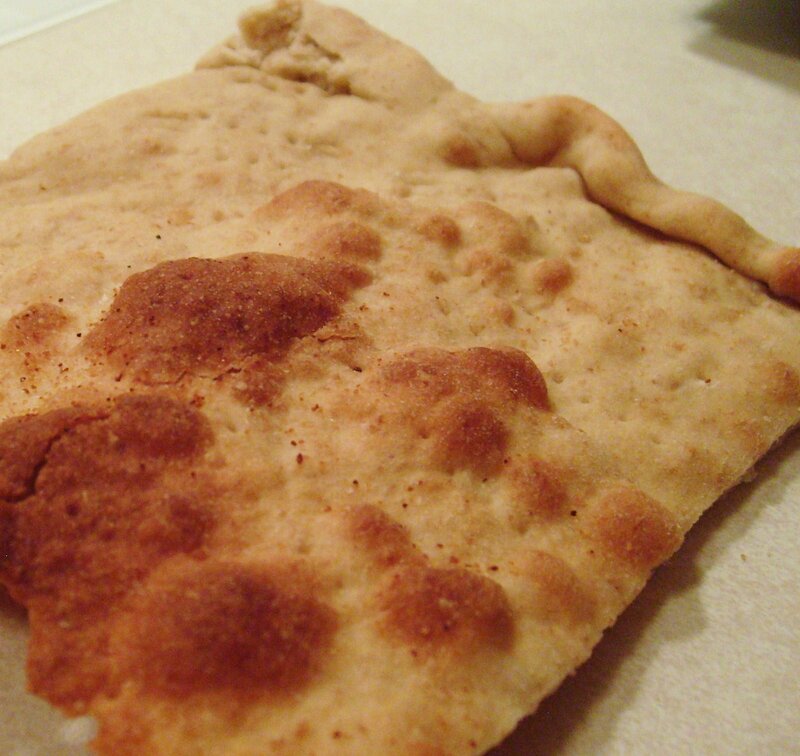 We’ve made flat bread, biscuits, corn bread, and crackers, but never buns. On Saturday I decided this was going to change. 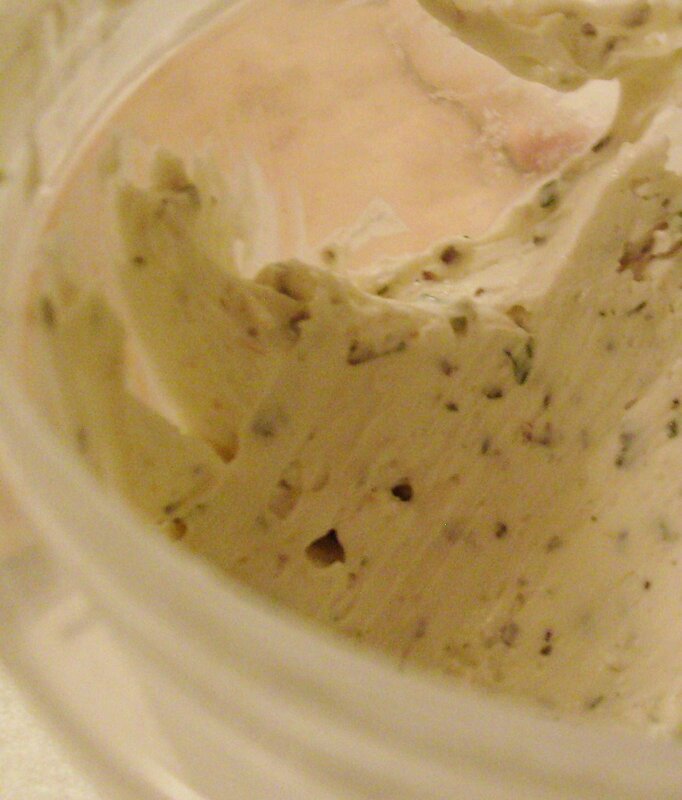 I found a recipe online (I apologize for not having a source – I didn’t think to save it!) that used the bread maker, so I figured, why not? I am always up for something new. I don’t think these buns could have been any easier and they tasted great. From now on we are definitely going to have real buns with our meals. 1. Add the liquid ingredients, sugar, and salt to the bread pan. Then add the flour into the pan, making it into a mound. Scoop a little hole in the flour (make sure it does NOT go all the way into the water – you don’t want the yeast and water to touch yet) and pour the yeast in. 3. When done sprinkle some flour on the counter coat your hands with flour. Remove the dough from the pan and bread it into 6-8 balls (the buns pictures were broken into 6 balls). 4. Place balls onto a sprayed baking sheet. Lightly spray the balls with cooking spray and cover with a towel. Place in a draft-free spot (the oven works well, if it is off, of course). Let rise until doubled in size (I think it was about 45 minutes). 5. Bake at 425F for 10-15 minutes, or until lightly browned. **I haven’t tried it yet, but I think you could do half whole wheat flour, half bread flour. You would need to let them rise longer and maybe add another 1/2 TBSP sugar and 1/2 tsp yeast. If you try it, let me know. I’ll update the post if I give it a try. As I mentioned in a previous post, Jason and I make our own bread. We have been doing it for almost a year now and haven’t considered giving up on it for a minute. It saves money and tastes much better than store bought bread. During the past year, we have eaten the same break 99% of the time. Sure, I have tried a whole wheat raisin bread and french bread before, but the original recipe is just so perfect, I did not see a need to change it. Since I have purchased my new cookbook, I have been trying all sorts of new recipes. I was thumbing through the bread section the other day when I stumbled across a recipe for Multi-grain bread. I figured that after a year of the same bread it was time for a change. The recipe was different than what I was envisioning for multi-grain bread, so I tweaked it a bit – I was actually quite nervous about this, because bread machines are very particular. You must be careful to follow the flour:sugar:liquid:yeast very carefully, or your bread will just end up being a big ball of cooked dough. This happened to me once when I first got the bread maker and eye-balled the amount of oats I needed for an oat bread…that time the bread ended up being for dipping and croutons. This time, however, everything worked out. I plan to make it again, but next time adding more whole wheat flour and oats. In doing this, I will also need to add another 1/2 tsp to 1 tsp of yeast to ensure that it rises. Always add the liquid ingredients, then the salt, and then the flour. The yeast should never touch the water before the machine begins, because if the water is not the right temperature, it will prevent the yeast from rising. When you add the yeast, make a well in the flour and pour the yeast in. Again, make sure the well does not expose any water. The yeast eats the sugar to ferment and produce carbon dioxide. The salt kills the yeast. 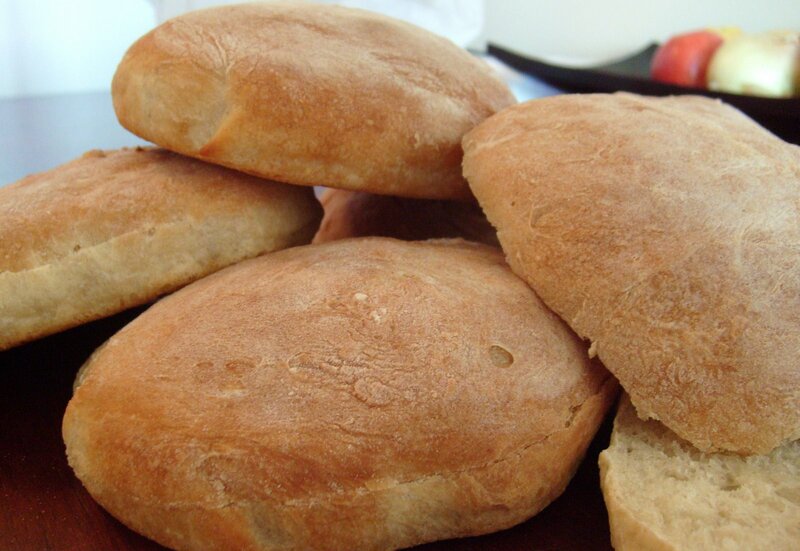 It is needed to keep the yeast from over fermenting and causing the bread to rise too much. However, too much yeast or the yeast coming in direct contact with the salt can prevent rising. If you use at least half whole wheat flour be sure to use the whole wheat setting on the bread maker. 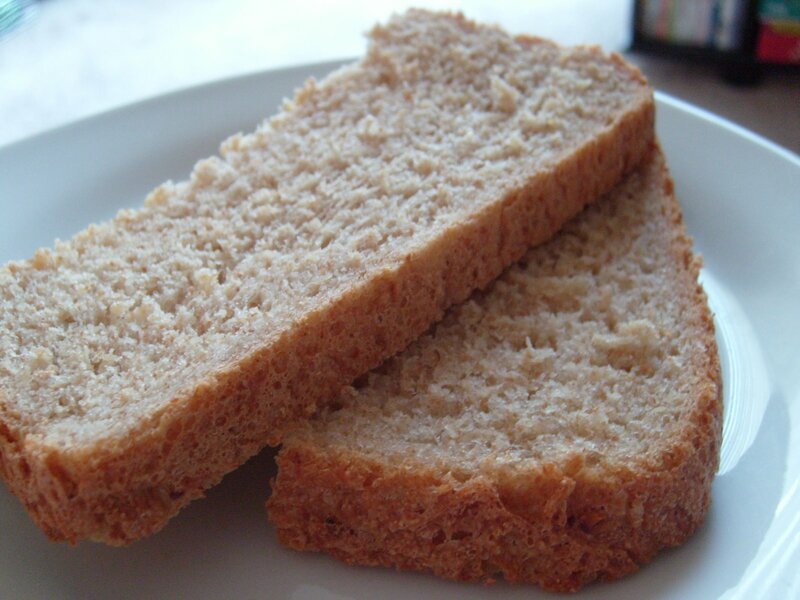 Also, be sure to use at least 1 tsp of yeast per pound of bread when using whole wheat flour. If the loaf is too big to cut slices, cut in in half horizontally first. Then slice it normally. This makes for smaller slices, but I personally would like smaller slices and be able to take more if I need, then larger slices that give you more than you need. If your recipe tells you to put a specific temperature of water into the mixture, be sure you do so. If the water is too cold the yeast can’t work, but if it is too hot the yeast will be killed. Place the water, liquid ingredients, and salt into the bread pan. In a separate bowl, mix the flours together so well distributed. 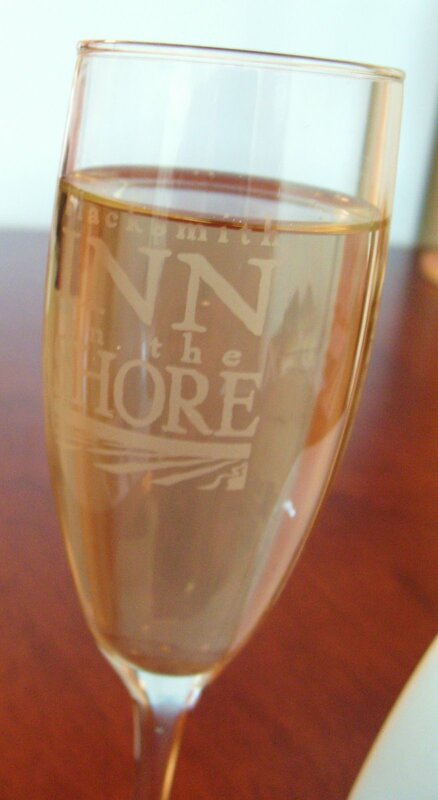 Pour onto of the liquid ingredients. With a spoon, make a small well for the yeast. Add the yeast to the well. Place the baking pan into the bread maker. Select the whole wheat setting and bake.